We searched PubMed, the Cochrane Database of Systematic Reviews, the Cochrane Central Register of Controlled Trials, and Web of Science from Jan 1, 1960, to May 31, 2016. We included studies analysing the e ect of antibiotic stewardship programmes on the incidence of infection and colonisation due to antibiotic-resistant bacteria and Clostridium di cile infections among hospital inpatients, with the exclusion of long-term care facilities. The search terms used included (“antibiotic AND stewardship” OR “antibiotic AND intervention AND resistance”) and (“meticillin/methicillin OR gram negative OR escherichia coli OR clostridium di cile OR ESBL OR extended-spectrum-beta-lactamase OR pseudomonas OR acinetobacter OR vancomycin OR enterococcus”). Reference lists of included studies were also screened. No restriction on study type was applied. Four systematic reviews analysed the e ects of antibiotic stewardship programmes in hospital inpatients. Schuts and colleagues focused on clinical outcomes, adverse events, and costs. Karanika and colleagues analysed antimicrobial consumption and costs. The incidence of antibiotic resistance was analysed in seven studies reporting on both antibiotic consumption and resistance. 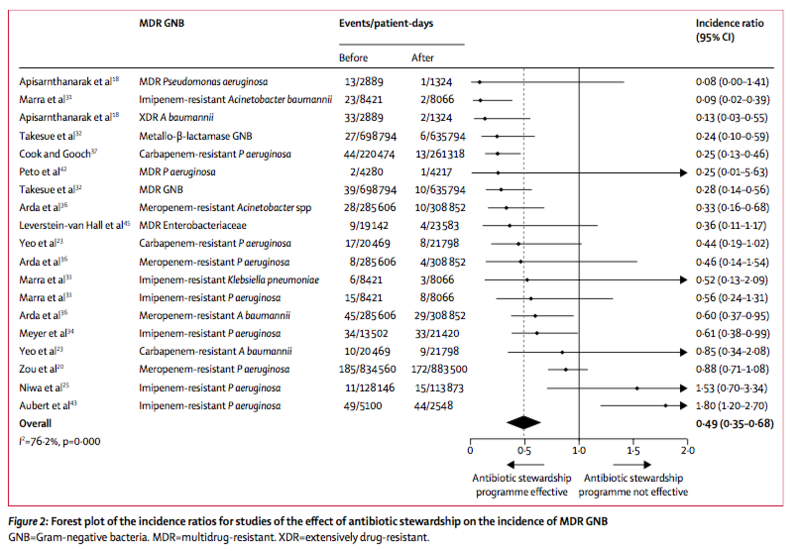 Feazel and colleagues analysed the e ect of antibiotic stewardship programmes on C di cile infections, but neither incidence rates nor incidence ratios were reported. 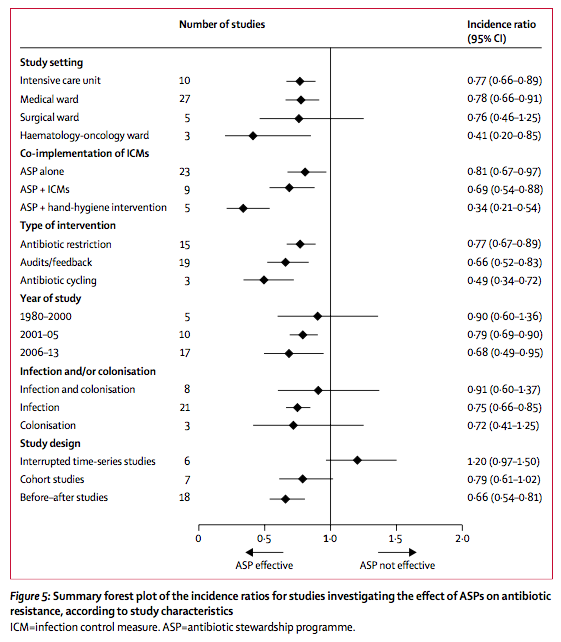 Davey and colleagues focused on 20 interrupted time-series studies and found that antibiotic stewardship was associated with consistent reductions in the incidence of C di cile infections but inconsistent e ects on antibiotic-resistant bacteria. rst time, the e ectiveness of antibiotic stewardship programmes in reducing the incidence of infections and colonisation due to multidrug-resistant Gram-negative bacteria, extended-spectrum β-lactamase (ESBL)-producing Gram-negative bacteria, meticillin-resistant Staphylococcus aureus, and C di cile. The e ect was increased in haematology-oncology settings and if antibiotic stewardship was co-implemented with hand-hygiene improvement measures. 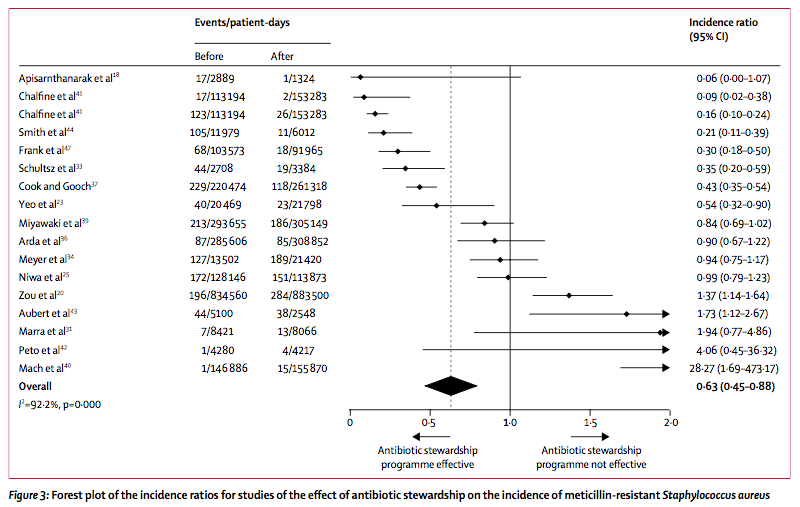 This meta-analysis provides stakeholders and policy makers with evidence for the e ectiveness of antibiotic stewardship programmes in reducing the incidence of infection and colonisation with antibiotic-resistant bacteria, in particular ESBL-producing and carbapenem-resistant Gram-negative bacteria. The evidence of increased e ect when co-implemented in association with interventions targeting hand hygiene provides important information for new antibiotic stewardship programmes. Antibiotic stewardship programmes have been shown to reduce antibiotic use and hospital costs. We aimed to evaluate evidence of the effect of antibiotic stewardship on the incidence of infections and colonisation with antibiotic-resistant bacteria. For this systematic review and meta-analysis, we searched PubMed, the Cochrane Database of Systematic Reviews, the Cochrane Central Register of Controlled Trials, and Web of Science for studies published from Jan 1, 1960, to May 31, 2016, that analysed the effect of antibiotic stewardship programmes on the incidence of infection and colonisation with antibiotic-resistant bacteria and Clostridium difficile infections in hospital inpatients. Two authors independently assessed the eligibility of trials and extracted data. Studies involving long-term care facilities were excluded. The main outcomes were incidence ratios (IRs) of target infections and colonisation per 1000 patient-days before and after implementation of antibiotic stewardship. Meta-analyses were done with random-effect models and heterogeneity was calculated with the I2 method. We included 32 studies in the meta-analysis, comprising 9 056 241 patient-days and 159 estimates of IRs. Antibiotic stewardship programmes reduced the incidence of infections and colonisation with multidrug-resistant Gram-negative bacteria (51% reduction; IR 0·49, 95% CI 0·35–0·68; p<0·0001), extended-spectrum β-lactamase-producing Gram-negative bacteria (48%; 0·52, 0·27–0·98; p=0·0428), and meticillin-resistant Staphylococcus aureus (37%; 0·63, 0·45–0·88; p=0·0065), as well as the incidence of C difficile infections (32%; 0·68, 0·53–0·88; p=0·0029). Antibiotic stewardship programmes were more effective when implemented with infection control measures (IR 0·69, 0·54–0·88; p=0·0030), especially hand-hygiene interventions (0·34, 0·21–0·54; p<0·0001), than when implemented alone. Antibiotic stewardship did not affect the IRs of vancomycin-resistant enterococci and quinolone-resistant and aminoglycoside-resistant Gram-negative bacteria. Significant heterogeneity between studies was detected, which was partly explained by the type of interventions and co-resistance patterns of the target bacteria. Antibiotic stewardship programmes significantly reduce the incidence of infections and colonisation with antibiotic-resistant bacteria and C difficile infections in hospital inpatients. These results provide stakeholders and policy makers with evidence for implementation of antibiotic stewardship interventions to reduce the burden of infections from antibiotic-resistant bacteria. German Center for Infection Research. First, although we had a wide range of eligible studies, we were limited to 32 studies because of the scarcity of essential data in the remaining studies. Incomplete data reporting and absent author responses were the main factors restricting our ability to do a more comprehensive meta-analysis of the clinical e cacy of antibiotic stewardship programmes. However, most of the excluded studies also reported a reduction in their antibiotic resistance rates. Second, we could not investigate the e ectiveness of single interventions in greater detail because most of the studies reported comprehensive results of composite antibiotic stewardship programmes implemented together with infection control strategies. Third, we included uncontrolled studies with pre–post data, and we cannot entirely ignore that the observed e ect could be due to an underlying secular trend. Fourth, we detected signi cant heterogeneity between studies. However, analysis of the sources of the heterogeneity showed that 20% of the between-study variance could be explained by the multiple pattern of resistance among included antibiotic-resistant bacteria. "The principal strength of our study is the analysis of the incidence of infections or colonisation as the primary outcome of the antibiotic stewardship programmes. To the best of our knowledge, this study is the rst to use this measure, which takes into account the individual patient-days of follow-up, is easily comprehensible, and is comparable across studies."